Daniel Britton Norman was born in Yeovil in 1891, the son of Joseph Norman and his wife Eliza Jane née Norman. It is possible that, especially in later life, he was known as Britton rather than Daniel since his name is inscribed Norman, B rather than Norman, DB on the War Memorial in the Borough. Joseph was the landlord of the Blue Ball Inn in Middle Street and in the 1891 census he was listed there with Eliza and 4-year old daughter Beatrice plus 3-month old baby son, Daniel. Joseph died in the autumn of 1897, aged 41, and his widow, Eliza, took over the license of the Blue Ball. By 1900, however, Eliza had moved to Wellington Street and had taken over the license of the first Royal Standard from Jane Locock, who had assumed that license briefly after the death of her husband, Thomas Locock. In the 1901 census Eliza was listed as the innkeeper of the Royal Standard and was living with her three sons; Rowland and Joseph, aged 19 and 12 respectively (neither of whom were listed in the previous census) and 10-year old Daniel. There was no sign of Beatrice. Eliza was last listed as the licensee in Whitby's Yeovil Almanack Advertiser of 1903. In the 1911 census Eliza was living at 16 Summerhouse Road with Rowland and Daniel, later moving to 16 Stars Lane. She died in the winter of 1931. Daniel worked as a fitter at the Hendford Motor Garage of AE Wheller on the corner of Hendford and Manor Road but was called up in April 1916. He joined the Army Service Corps, Service No DM2/169309. Sadly, after just three weeks in the army Daniel was taken seriously ill and hospitalised at the Royal Herbert Hospital, Woolwich, where he died on 26 May 1916. He was 25. On 2 June 1916 the Western Gazette reported "Much sympathy is felt for Mrs E Norman, of 16 Summerhouse Road, on the death of her youngest son, Private Daniel Briton Norman. Private Norman joined the Army Service Corps about seven weeks ago, and had nearly three weeks training, when he was taken seriously ill. He was conveyed to the Royal Herbert Hospital, Woolwich, where he died on Friday last. Before joining the Army he was employed as a fitter by Mr AE Wheller, of the Hendford Motor Garage, and was 25 years of age. Mrs Norman and Mr and Mrs Wheller, 64 Hendford, wish to thank their many friends for the kind sympathy shown to them in their sad bereavement." 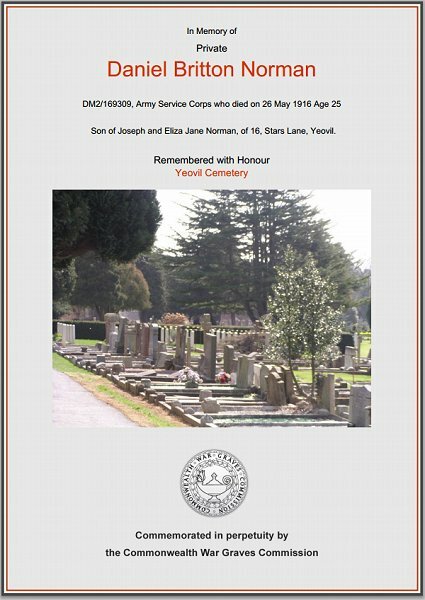 Daniel was buried in Yeovil Cemetery, Grave B263, and his name is recorded on the War Memorial in the Borough although, as pointed out above, incorrectly recorded as Norman B rather than Norman DB. 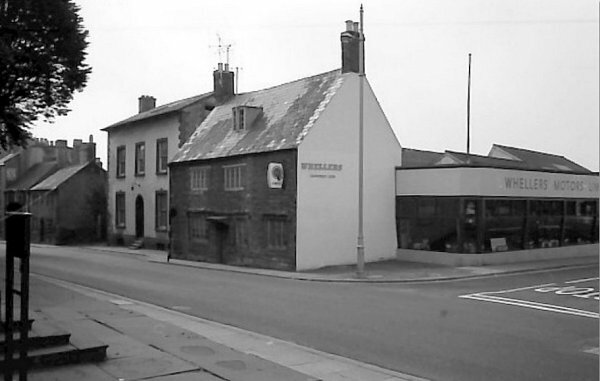 Opposite Hendford Manor is Manor Road with Whellers Motors Ltd. where Daniel worked as a fitter before enlisting in the army. This corner is now occupied by the Homeville House Complex. The Commonwealth War Graves Commission certificate in memory of Daniel Norman.